Cutting edge research in aging, artificial intelligence, behavioral health, child welfare, crisis and bereavement, homelessness, human trafficking, management and organizations, serious mental illness, substance abuse, social determinants of health, social adaptation to climate change and man-made disasters, and veterans and military families. First to develop and fully articulate the concept of "policy practice"
With one of the most abundant financial aid pools in the country, USC provides more than $330 million in scholarships and aid. After graduation, every Trojan joins an invaluable worldwide support network of nearly 230,000 living alumni. The Trojan Family is hailed as one of the strongest networks in the nation, consisting of devoted alumni who maintain a close association with the university, mentoring students and opening career doors for fellow graduates. With alumni groups on five continents, Trojans roam, but they are never alone! 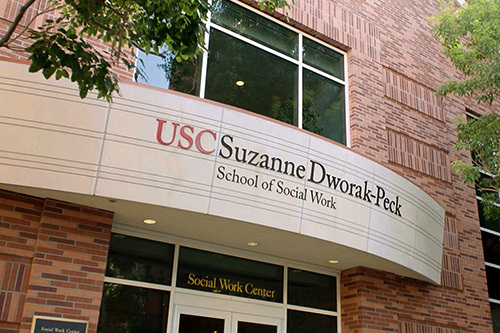 And don’t forget the USC Social Work Alumni Association to stay connected to the school, your profession and fellow classmates, too! Our students spent more than 1.5 million hours at their field placements and internships, a service that is valued at more than $40 million.